Link is the main protagonist of the Legend of Zelda series who comes from Hyrule and is of the Hylian race. In the series of games he attempts to defeat Ganon and save Princess Zelda and her kingdom from the forces of evil. This time figma is back with the Twilight Princess version of Link. I have to say right off that in comparison to the last figma I received Link's paint work is really good, almost back to the standard I am used to. There is only one error where the paint is chipped on his bracer and his knee joints are not an exact colour, two miss steps are admissible in light of previous figures. He is also utalising some new joint system design - although I am unsure if this is a good thing. His shoulder has been altered to allow him to get into more dynamic poses, however when he is standing still with his arms down there is a gap. Not great. For accessories he comes with three facial expressions which all look good - although I think a smiling one would have been nice. And he has three pairs of hands - I believe he comes with more if you get the DX version. 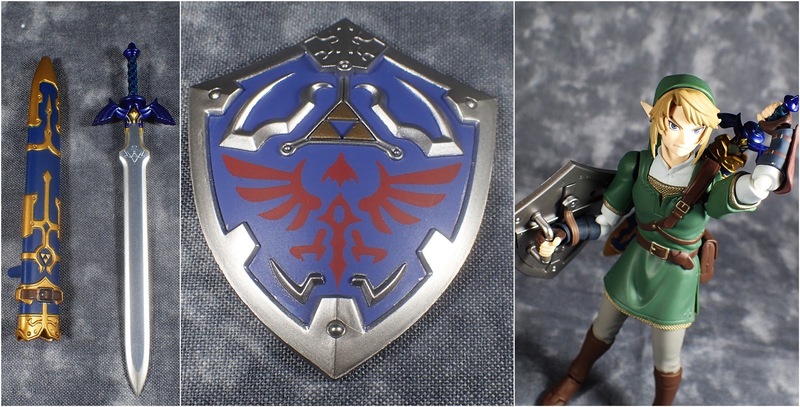 This regular version only comes with two other items, the master sword and shield and I am glad to see that they did not reuse the mold from the previous Link and also that this time the handle of the sword pops off. The previous one did not and I like many others broke it trying to put it in his hand. One thing I do like about his new shoulders I have to say is that he can now draw his sword from his back - awesome. Like the previous you can also mount the sheath and shield on his back. Overall I think I prefer this version of Link - although the new joints can look weird when unposed I think the range you get now for dynamic poses almost makes up for that. I also prefer his more grown up appearance. If you are a major fan I would say get this one in the DX version as it comes with heaps of weapons but for me I've only played a few Zelda games so this one is fine.